Visa and Mastercard are now accepted for your convenience. 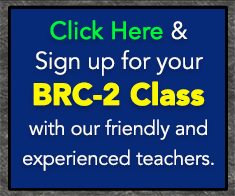 Save time and money by signing-up for our BRC2 course. In one day, you will learn expert motorcycle handling and feel much more confident on your motorcycle and on the road. This course will also help in getting your motorcycle license, fast and easy. You must be 18 years of age and know how to operate your own motorcycle and be able to control it well! There are two screening exercises for the BRC2. If you cannot control your motorcycle fully and pass the two screening exercises, your enrollment fee will be put towards a BRC1. 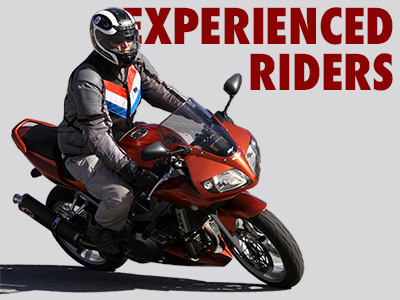 The BRC2 is designed for “experience” riders who already possess riding skills and are either returning to riding or seeking a refresher course to practice and renew riding skills. 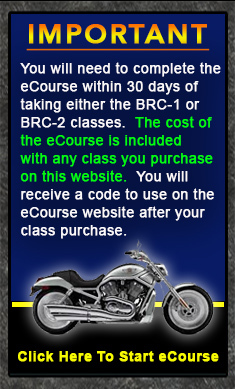 The BRC2 is an intermediate course designed to help you learn new skills while operating your own personal motorcycle. You will need your temporary motorcycle license to take this class. Bring your own licensed motorcycle along with proof of registration and insurance. Motorcycle must pass a pre-ride inspection. Bring your riding gear for range exercises including: long sleeves–shirt or jacket, long pants, sturdy over-the-ankle footwear, full-fingered gloves, and helmet with eye protection. 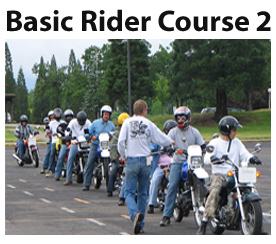 Only six BRC2 courses offered during the 2018 motorcycle training season. You will gain a wealth of experience/knowledge from our Basic RiderCourse 2. Please complete MSF’s Street Strategies online e-Course within 30 days of taking the BRC2 course. The cost of the Street Strategies online e-Course is included in our price of $160. Upon signing-up for one of our classes, you will receive a separate e-mail with a coupon code for you to enter into the lower right-hand corner of the registration page for MSF’s Street Strategies online e-Course. Students must bring the Street Strategies e-Course completion certificate to class. FREE MSF Street Strategies online e-Course with Registration of Class!